Natural Safety Solutions can provide you with expert health, safety and environmental (SHE)audits and understand that a fresh pair of eyes is often beneficial to help businesses ensure that there are no legal or best practice gaps in how their health and safety is managed. 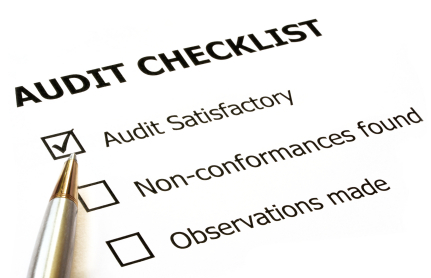 Audit against known standards such as BS OHSAS 18001:2007, HS(G)65, ISO 14001 or ILO OHS etc. Audit of health and safety following a significant incident or injury. A health and safety audit is a good way to ensure that your business is complying with the latest health and safety legislation and that your employees are safe within the workplace. Natural Safety Solutions will ensure that a health and safety audit carried out on your business allows you peace of mind that your company is up to standard.